HALLIE EPHRON: One of my favorite humorists Molly D. Campbell posted a hilarious take-down of writing rules on her blog, View from the Empty Nest. With her permission, today we're sharing it with our world. CAUTION: Do not read while drinking a cup of tea. MOLLY D. CAMPBELL: I am a published author, so that makes me an authority on writing things, doesn’t it? There are rules to follow. I try to follow them. One rule that has me flummoxed is the current ban on adverbs. You read that correctly. Correctly is an adverb. So how should I have said that just then? You read that with accuracy? Bah. But since I plan to write more than one novel, and I am actually (another adverb) a third of the way through my next one, I thought I would share with you some of the no-nos in the author game. You know, so you will be a better critic in the future. But be kind in those Amazon reviews—some of them have been so harsh as to cause writers to contemplate becoming auto mechanics and cocktail waitresses instead. But I digress. You aren’t supposed to do that as a writer, either. TELL: Audrey felt just sick about having to inform Robert that she couldn’t possibly marry him. After all, she still got cold shivers when she thought about Pierre. Pierre was the love of her life, and Audrey believed with all of her heart that he would return from that trip down the Amazon River to discover the cure for arthritis. SHOW: Audrey woke, her pillow damp with her tears. She put her hand on her forehead, which throbbed from the dream that was so vivid. Pierre was rowing towards her, his eyes full of terror. Suddenly, out of nowhere, a giant boa constrictor reared out of the water, slithered onto Pierre’s tiny boat, and enveloped him in a twisting death grip. See? So much more literary. DESCRIPTION: The sky darkened. The parched, mahogany leaves rattled in the sudden breeze. Flora felt the goosebumps rise on her arms, drawing the thin muslin wrap around her. Thunder rent the air with dissonant anger. Grant began to pack the picnic things into the basket, but not before the huge, cold drops began to fall. The sky took on a greenish hue as the lightning pierced the clouds. Grant seized the picnic basket in one hand and extended his other out to the frightened and shivering girl. As they hurtled toward the distant farm cottage, a thunderclap nearly knocked them down. Which book would you rather read? I thought so. So you see, we authors don’t just jot down whatever comes into our heads. It’s a craft. Nay, an art form! We spend hours just sifting through our heads for the right word. We agonize over those adjectives, and we brutally eliminate those adverbs (oh, right—brutally is an adverb). We struggle with realistic dialogue. HALLIE: Did I warn you or what? What do you think about "writing rules" and which ones do you violate with impunity? Molly writes from her pantry, often in pajamas. She exercises regularly, despite the fact that she has sustained numerous injuries involving barbells and exercise balls. She successfully raised two gorgeous daughters, who both pay their own bills. Molly can also be found at: http://momswhoneedwine.com. 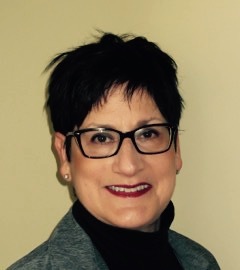 Molly is a two-time Erma Bombeck award winning writer. She hosts her own intelligent and funny blog, www.mollydcampbell.com, as well as writing for the popular international web site "Moms Who Need Wine." 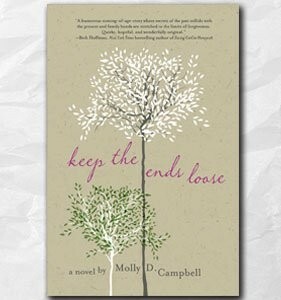 Her latest novel is "Keep the Ends Loose," a wry and witty coming of age novel. Miranda Heath is a quirky fifteen year-old with cinematic dreams and a safe, predictable family. That is, until she decides to pull at the loose end that is the estranged husband that her aunt never divorced. Warm, funny, and uniquely perceptive, Her short story collection began as a Twitter stream of character names that she invented in her spare time, followed by a brief description: "Loretta Squirrels beats her husband and makes moonshine." Molly then decided to write a book about her characters. She teamed up with a fantastic artist to bring them to life. The book soon became an Amazon Pop Culture best seller. I am laughing far too hard to even pick up the coffee cup . . . Molly, you've definitely made my day! I have no idea about which writing rules ought to be broken [although the use of an occasional adverb doesn't seem too outrageous to me], but I do think that surely [oops] writers must know best . . . . Frankly, I positively believe that adverbs, when used sparingly and judiciously, have a great deal to offer an otherwise overtly character-driven tale. And I LOVE Erma Bombeck--and didn't know Molly was the genius behind the mom's with wine blog. Looking forward to finding more of her work! Hysterical. And I took your advice, no tea--coffee. It almost matches the wall color where I spewed it. Dang--blogger has no photo insert capability. I do have pix. All of these rules are probably true, and definitely made to be broken. Especially that adverb thing. The puke green sky--priceless. Thank you for sharing. "That's great!" she said enthusiastically. But not much better: "That's great!" she said, jumping up and down and clapping. Sometimes the dialogue wants to stand alone. "That's great," she said, swirling her wine and avoiding eye contact. Better than "That's great," she said pensively. When you break a rule, break it good. There is nothing better than starting the day with a giggle and this was PERFECT! Thank you! My thoughts on writing rules are that what works for one writer is not necessarily what works for all writers, just like what works for some readers is not going to work for all. So write what's in your heart. Break rules. Have fun. Chances are that a lot of readers will love it - they do not, after all, know that there are rules that you're supposed to be following. Molly, I need to start looking for your work! Thanks for some good laughs. I do think writing rules change over the years. When I was a freshman in college back in the Dark Ages, our English Composition professor taught us that all the writing rules we learned in high school were wrong, wrong, wrong. In the past few years many articles I've read about writing stressed that the rules I learned in college were wrong, wrong, wrong. Yikes. If the use of adverbs is such a terrible practice (it doesn't bother me at all to read adverbs used the write/right way!) then ban all the books that use them, and fine public speakers of adverbs for the use of improper language:-) Yeah, that will never happen. Anyway, thanks again for the laughs! Oh, my gosh, I love you. Just saying. My writing brain always has this second track going while I'm working. NO! THATS TELLING, I yell at myself. Every day. Ah. The only rule that I really...adhere to, maybe, I think, is avoiding portents. Little did she know, had she but known, all that. ANd the adverb thing is a point of view problem, right? I mean--if you're in the head of a person, that person isn't thinking: I'll say that enthusiastically. Judiciously is shorter, but: she searched the green beads, one by one, examining each, and keeping only the biggest is better. At least, easier to picture. But I love that we THINK about this, and that's the point, right? So true,Hank, it CAN be a viewpoint problem. The thing about adverbs is they are shortcuts, economical ways of expressing an idea. And the problem for a lot of us who started life as technical writers (I know you're out there) is that adverbs are a technical writers friend. Because you're trying to make it short and clear. Technical writing also has no narrative voice (usually) or viewpoint. So when you make the transition to writing fiction you've got a lot of habits to break. I saw this before and it's just as funny the second time around. Those poor adverbs. They get such a bad rap. "Learn the rules like a pro so you can break them like an artist." That's my motto. I love adverbs, though I try to use them judiciously. I love dialogue tags: "he roared, he bellowed, she murmured, she whispered, she stuttered" but once a chapter seems to be about right. Your examples of show don't tell were right on. Adverbs don't bother me at all. However, I've read books where the author needed to practice Show don't Tell, and it was painfully obviously. Your example here of Tell is not what people are talking about when they say that. And, depending on the novel, I actually liked both the descriptive and the narrative take on that scene. I've read books where the author did try to narrate through dialogue, and it was awkward and weird. Still, overly long description for the sake of showing off how wonderful the writer is at painting a scene are boring and do slow things down. Yes, I'm arguing for and against those rules. Well, except the adverb rule. I really don't mind adverbs. Okay, I did snort my tea.... So funny! And, yes, I agree that one can use too many adverbs. BUT adverbs are a perfectly good part of the English language and a ban on adverbs is just silly. I think this trend may come directly from Stephen King's rules on writing. I also like good, fast-paced dialog, but I'm writing novels, not screenplays, and descriptions have their place. Mostly, it's just common sense, isn't it? Thanks for starting my day off with a good giggle, Hank and Molly! Ha. I read between swallows of coffee. No casualties here. Rules? We don't need no stinkin' rules. Fortunately I'm a reader, not a writer. Erma Bombeck was one of my favorites. I always read her column. Good on you Molly. Enjoyable post and comments too. Even stranger is the anti-adverb admonition expressed as, "Don't use words ending in -ly." Because we don't know what an adverb is? Prohibit words ending in "ly"...giving the world "Poll put the kettle on/And we'll all have tea" and Moll D. Campbell as the Reds' guest today? Oh, no...I can barely bear it!!! Thanks for the smiles. Love the post! And I use sentence fragments and start sentences with "and" and "but" sometimes. Probably too often. We lived in Dayton for a little over 6 years and our next door neighbor's mother had been a friend of Erma Bombeck's! Small world. Congrats on the awards and thanks for the post.